IBF super flyweight champion Jerwin Ancajas (28-1-1, 19 KOs) totally destroyed an over-matched previously unbeaten #4 IBF Jamie Conlan (19-1, 11 KOs) in stopping him in the 6th round on Saturday night at the SSE Arena in Belfast, Northern Ireland. Ancajas, 25, knocked Conlan down 4 times in the fight. The referee halted the fight in round 6 after Ancajas knocked Conlan down with a right hand rabbit punch to the back of the head. Conlan hit the deck in round 1 from a delayed reaction from a right hand to the head. In round 3, Ancajas dropped Conlan with a left to the body. Conlan was close to being stopped after Ancajas caught him against the ropes and unloaded with a storm of body shots as the round was ending. Conlan hit the deck again in round 4. Ancajas lost a point for a low blow in round 5. Referee Steve Gray stopped the fight at 0:52 of round 6 after Conlan had been dropped by a right hand. That was the 4th knockdown of the fight. If Gray had allowed the fight to continue, Conlan likely would have continued to get dropped by Ancajas. The reason why fight didn’t end quickly in the first few rounds was due to Ancajas not going for the kill each time he was knock Conlan down. Ancajas was very patient. Each time he knocked Conlan down, he fought like he wasn’t in any real hurry to end the fight. Ancajas seemed to know that he was going to be able to keep knocking Conlan down no matter what he did. Conlan looked like he was out of his depth from the first knockdown of the fight in round 1. That knockdown set the tone for the entire fight. 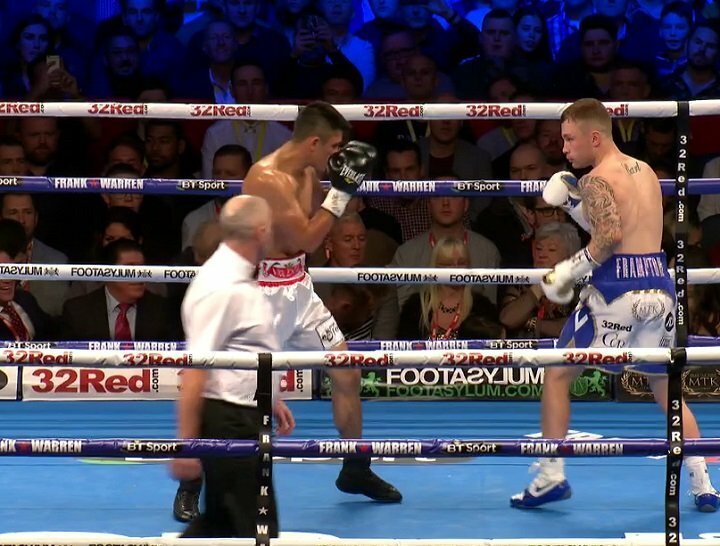 it showed that Conlan couldn’t handle the punching power of the powerful southpaw Ancajas. There was nothing wrong with Conlan’s power and size. If he had been able to land his big power shots on Ancajas for 12 round, it would have been a hard fight for the Filipino. Conlan couldn’t take the body shots from Ancajas, and that was the story of the fight. The win for Ancajas was his third defense of his International Boxing Federation 115 lb. title that he captured last year. Ancajas should think about looking to unify against the other super flyweight champions. He’s got the talent to give some of the other super flyweight champions some problems. WBC champion Srisaket Sor Rungvisai and WBO champion Naoya Inoue might be too good for Ancajas, but WBA belt holder Khalid Yafai would be a beatable opponent for him. Conlan has some talent, but I don’t think he’s got enough for him to ever win a world title at super flyweight. If he could move down to flyweight, he might stand a chance if matched against the right champion.